Since 2006, Docksta Havet AB is working to support sailing experiences in Sweden within the High Coast and to awake new interest in the natural, cultural and touristic coastal assets of the Höga Kusten World Heritage. The beauty of the High Coast waters and its natural coastlines is a great value to share within the international sailing community. Docksta has become a landmark for many Baltic Sea Cruisers: they are coming in Docksta from all over the nordic Countries (Sweden, particularly from south of Sweden and Stockholm, Finland, Denmark and Norway), and from abroad (mainly Germany, UK and Holland). strengthen communication links within groups (yacht clubs, guest harbours, sailing associations, etc) and between local economic and social communities (and in linking with national and international networks). Docksta Havet exploits activities and experiences into an area of strong engagement & visibility in the most accessible point of contact between land and sea of the High Coast, where the "marina" ambient can be very distinctive but at the same time affordable. 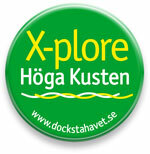 The "waterfront" playground at Docksta Havet and the outdoor experiences in the area of Skule can be very special: we hope to be able to give people & sailors a variety of ways to experience Höga Kusten's "regeneration" and to give a chance to find their own special reason for being drawn to our coastline. What plays here? Exhibitions, pop-up stores, summer workshops, indoor and outdoor events, meetings... which can be set-up temporarily at Docksta Havet. For information, please contact us. People have transformed how they consume information, research products and services, make purchasing decisions and share their views and experiences. This is the new world of marketing: one where people have their needs met and their questions answered. Where marketer's goal is to provide us with information that we want, "when" we want it. Now that’s marketing we love. During the summer 2013, Docksta Havet and Indesit invited the Sailors cruising the High Coast to discover the new Innex washing machine. For all Base Camp's guests was possible to use it and try the smart Push&Wash program at the Sailor's Service Hus during their mooring. Indesit company has been guest star and good fellow of our summer. During the summer, Docksta Havet and Apuliens Smak invited the Sailors cruising the High Coast in discovering new products and tastes of the italian Puglia region by listening to stories, learn new recipes and tips on how to use them in a fast and simple way onboard or at home. The experience and the suggestion of his photographic works helps to underline the importance to re-discover and keep memory also of the places where the "world" of land and the sea meet each other. During the summer 2006, Docksta Havet hosted the preview of the exhibition Ephemerae of Nik Ferrando. Here is the gallery of the exhibition. "The location aspires to become a display of ideas – aware that more ideas mean more events, more events mean more people, more people mean stronger local economies"
to increase the economic, social and cultural benefits associated to the events of the area. Are you looking for a seaside location in the High Coast for your pop-up event ? Here is possible to transcend visitors and guests expectations. If the location plays a fundamental role in the positive features of an event, Docksta Havet encompasses the logistics but above all the emotional potential required to make it memorable and unique. It also represents a stimulating challenge of great potential to promote many positive natural and tourist features of the area of Skule. Into the heart of the High Coast World Heritage, at Docksta Havet you can set-up temporarily your exhibit, pop-up store or corner, summer workshop, indoor and outdoor event or meeting. Docksta Havet aims at enhancing the quality of the events through the propagation of knowledge and experience between our guests and the partners involved. Here the player can initiate and consolidate new contacts through better visibility of their assets and better means of communication. High Coast Sailors, what's next at Docksta Havet Base Camp? Next summer don't miss to sail to Docksta! Walking, biking, hiking and running from the piers of the marina you'll discover the stunning natural area around Skuleberget and a lot of outdoor activities and events that people have enjoyed putting them together to provide you with a great "taste" of the High Coast. DOCKSTA HAVET BASE CAMP: Vi träffas där! In 2006, the goal of "Docksta Havet" idea was to “reinvent” the area of the marina at Docksta - restore and reassess a location in which to develop all the potential of the activities that could exist there. The dream was to make it a beautiful place, where people can meet to do and see, where things happen. The strategic position of the area - within the current tourist and commercial dynamics - assumes an even greater importance and represents an ongoing opportunity to be developed. Docksta Havet occupies a private substantial surface area of 9,000 sq. m facing onto the sea on the Dockstafjärden. It is characterised by a development plan which includes the piers of the private gästhamn, the banks, the new building housing the marina's facilities, the main building (the "Havets Hus" is the headquarter) with the terrace and the hall with a fine seaview, the working Docks, the boat houses and a number of service facilities. The marina in Docksta is an accessible point of contact "between land and sea" on the High Coast World Heritage. Docksta as an unique position in the heart of the Höga Kusten. Thanks to its geographical location and visibility connected to its position overlooking the sea, intersecting the E4, Docksta Havet exploits an exceptional relationship with the seaside, the village and the natural area around the Skuleberget. "Mellan land och vatten" and "Torget mitt i Höga Kusten" were the payoffs that we chose in 2006 for Docksta Havet's brand: we believed that such an extended and central location deserves a logic of intervention in line with the uniqueness of the site, the buildings and its scenic qualities without limiting itself to the strong fascination transmitted by the architecture of the docks, but rather to continue on to the creation of "a square on the seaside" in the Höga Kusten. In the Seventies the marina in Docksta experienced a period of great bustling activity. Then the momentum was lost. In few decades sailing and sea enthusiasts have seen themselves progressively deprived of a marina that by the end of the Seventies was offering the maximum level of facilities and also provided the only refueling point for sailing boats in the fjord close to the E4. Looking at the situation of the harbour and the area before April 2006, you see how fast can be the decline of any social and tourist activity as a consequence of the lack of conservation of the structure or the loss of organizational push. So, sailors and long distance cruisers, particularly, were not coming to Docksta anymore. Docksta Havet was born to restore unity to the management of the area, structures, activities and facilities which are part of the marina. Early in April 2006, the "project" started immediately with a new local organization - Docksta Havet AB which, supported by private investments, reintroduced facilities with an extraordinary maintenance works on the piers and buildings. By buying the property and deciding to restore the "vitality" of the marina in Docksta, Docksta Havet has warded off a real danger of disappearing having prevented that a logic of dismantling prevails. On June, 1st 2006 started the first seasonal opening of the Base Camp, with safe moorings and confortable services fully operative and available for sailors and cruisers visiting the guest harbours.